www. Machine Knitting .net would like to present patterns free of charge and hopefully add new ones with some regularity. Typically they will be a cut down version of the full instructions found elsewhere on the Machine Knitting website. PDF’s are used because it is a fairly common format used worldwide, when printing, it should auto fit to your printer. So far there is only 1 pattern, more will follow! To open the pattern as a PDF in your browser, just click on the pattern and it should open. Once you have viewed the pattern, just click back on your browser to return to this page. If you have trouble opening the PDF, the latest version of Adobe Reader can be found here. Thanks for what you are doing. Love the sock pattern. Thanks for the instructions. I have hand knitted scocks years ago. Wasn’t sure how to make them circular on the machine, because I didn’t want to put a seam in them. Now I can’t wait to try them on the machine.Thanks again. I just love the sock pattern. 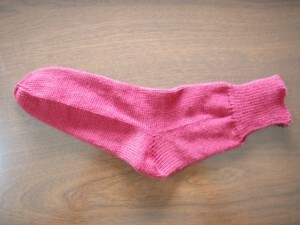 Never knitted a sock before and I have a pair of socks now. And I knitted them on my machine. Thank you for the excellent beginner instructions!